I had this idea for a blog post and thought that you might find this interesting or useful. Maybe you have a similar dream. In that case, definitely have a read, and please let me know if this type of post was interesting for you. I would love to hear. The book I wrote and talk in this post covers my flyfishing trips to 5 very different locations around the world (South-Africa, Sweden, Japan, Finland and Iceland). And then it is a story how those travels turned me into a flyfishing freelancer first, and a flyfishing entrepreneur later. But then about a year ago I had a big realization that it would actually be totally possible to carry out this dream. I had been reading a blog where a lady from US wrote an ebook about time management. And reading what she had done, made it clear in a step-by-step way, that because of the internet and self publishing, if I just decided, I could do it. Such a realization. So then I decided. And that was the biggest single step. After that the rest was just working with a timer and endless studying of what self publishing, book marketing and law of selling digital goods inside EU meant. But I was on my way. This was 8 months before the book was out. Writing was partly fun and partly a struggle. First draft of the book was quickly done. I wrote it during last summer. At the summer cottage. By the lake. In the nature. That sounds exactly like the mental image when I’m thinking what it must be for ‘real’ writers. They sit with their laptop (or quill) by the window watching over a beautiful view. Sun is setting all day long. And a cup of tea is steaming on the table all day long. And the perfect text just flies on to the screen (or parchment). After the first draft the writing got more difficult. I used a timer to force myself to write. Every day I would write at least 30 minutes using an online timer or setting on my phone alarm. And if nothing else, I would write for 30 minutes how I cannot think of anything to write today. This was still about 8 months before the book was out. I first planned just to sell the book through Amazon. So I wouldn’t need to worry about building the sales page and paying a bank for the “purchase” buttons. But since Amazon Kindle books aren’t that popular in Finland yet, and there are hardly any Finnish language e-books on Amazon, I thought I need to have a web-site for the book. No-one will find it just on Amazon. And with my own book web-site I can market the book easier. The plan is definitely to publish the English book as an Amazon Kindle book, but for that version as well, I think I will create my own web-site in addition to the Amazon ”shelf-space”. To create the book web-site I used Leadpages, since it was easy enough for me with no tech skills. And to add a BuyNow button to the web-site I used Paypal, which allow people to buy my book with credit card or Paypal account. And it doesn’t cost anything until someone buys something. This was about 4 months before the book was out. Step four took way longer than the original writing itself. I asked about 10 people to proofread the book. Some of them knew grammar and some of them knew flyfishing. I wanted to get opinions and feedback from my flyfishing contacts. At this point I actually think that perhaps it would have been worth to hire an editor as well. Would have saved time. I did also get a lot of value and useful tips from a book called APE: Author, Publisher, Entrepreneur—How to Publish a Book. For the cover of the book, I selected two pictures and got such a good feedback from people on Kajana Club’s Facebook, one forum and Google+ pages. That was amazing. Over 50 people voted for their favorite one and gave feedback =). And after that I had a local young entrepreneur to design the final cover. This was about 2-1 month before the book was out. Now this part is interesting. How to let people know the book exists? I tried Facebook marketing and got some results. I actually thought that if you have a traditional publisher, you can just write and don’t have to worry about the marketing and sales of the book. They will take care of that. But talking to a friend whose first book was published about a year ago, made me realize that you still need to do the work mainly yourself. Unless you are a big name author. Since I’m no Rowling, I probably wouldn’t get much time or budget from the marketing gurus of the publishing house. 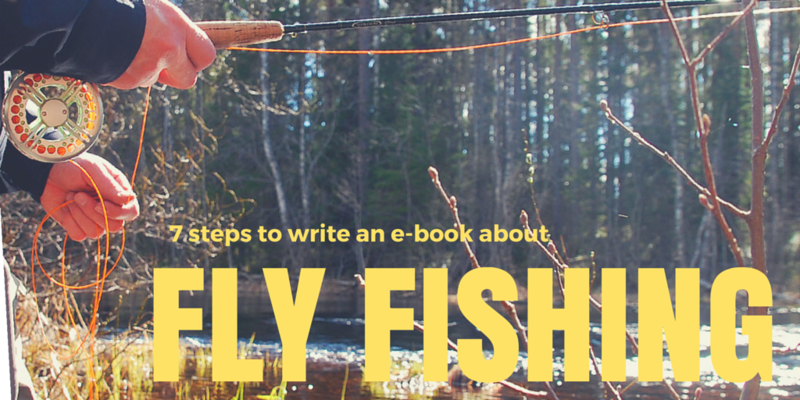 I contacted fishing magazines and blogs and sent media releases and pre-copies of the book for book reviews. At least two magazines are now in the process of writing a review. And I can admit I’m really nervous and excited to read what they say. It’s like they are judging my baby. Well, those reviews haven’t been published yet. So let’s wait and see, iik. This was about 1 month before the book was out. Can e-authors have book tours? I had this idea that in the “old world” authors travel around the country and have book readings in book stores. I think that is so romantic idea. Could I have that too? Since I wrote an e-book (that isn’t available in the book stores), I should have an e-book tour. And the e-tour would obviously happen in the internet. How cool is that? Anyone could join from their home. It would be a live book reading over a group video call. How cool is that!! You can tell that I am pretty excited about this idea. Then one person emailed me that he is buying the book, but what a pity that he cannot ask me to autograph his copy. That got me thinking. Why not! So now essential part of the book tour is, that if you purchase the e-book during the book tour, you will get a personally autographed copy. This book tour is yet to come.. but I’m definitely excited about the idea! The next big step was to get the book translated and published in English. This was finally done about half a year after the Finnish version was out. I fould the translator from Elance and must say that I was really happy how it turned out. It was so interesting to read my own text after somebody else put it in beautiful English. Internet is so awesome, and full of opportunities. PS. If you had any thoughts while reading, I would love to hear what’s your take on this. And do you perhaps have some similar plans? Go ahead and comment below. And if you know someone who might like this, share this post with them.